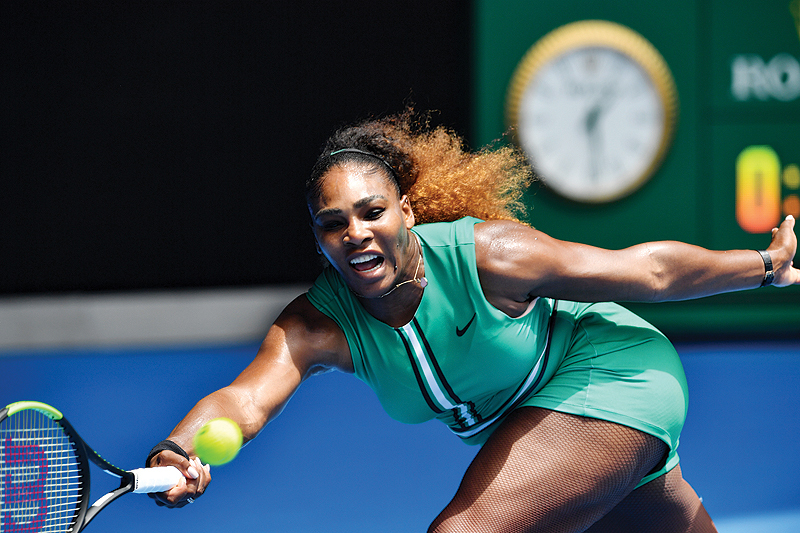 MELBOURNE: Serena Williams denied yesterday her bid for a record-equalling 24th Grand Slam title was a distraction as her Australian Open campaign launched with a straight sets mauling of Germany’s Tatjana Maria. In an ominous warning to her rivals at Melbourne Park, the American dismantled Maria 6-0, 6-2 in only 49 minutes, justifying her status as bookies’ favourite to claim an eighth Australian title. The 37-year-old won her 23rd major Down Under two years ago while eight weeks pregnant and is now attempting to match Margaret Court’s mark of 24 singles Slams on the Australian’s home soil. Williams said she was not dwelling on the bid for history, which would confirm her status as the greatest player of all time. “I have been going for the record what seems like forever now, so it doesn’t feel any different,” she said. Her 2017 triumph in Melbourne gave her the outright Open-era record for singles majors ahead of Steffi Graf’s 22, leaving only Court’s tally of 24 titles — 13 of which were earned in the amateur era before 1968 — for her to chase. It was Williams’ first outing on tour since her infamous meltdown at the umpire while losing the US Open final to Naomi Osaka in September. “I, like, literally have no comment,” she responded when asked about the controversy, which split opinion in the tennis world. She was unfailingly polite to the chair umpire at Melbourne Park and the centre court crowd greeted her warmly, cheering as she walked out. There was further applause when she removed her black warm-up jacket to reveal her outfit for the tournament-a jade-green jumpsuit matched with fishnet stockings. “It’s a Serena-tard,” she said when asked to describe the garment. Her demeanour was steely but calm once play began and the American swatted aside her opponent with ease, making a mockery of her 16th seeding at this year’s tournament. She won her first service game to love then effortlessly broke Maria’s serve, blasting winners seemingly as will as she claimed the first set 6-0 in just 18 minutes. She eased up slightly in the second set against someone she described as “incredibly tricky”, with Maria snatching two games before succumbing to inevitable defeat. It was small consolation for the German, a neighbour of Williams at Palm Beach, Florida, who left the court in tears after the drubbing. “I’m glad that I was able to come out and do what I needed to do… I feel like I’m in the right direction. We’ll see,” she said. The win sets up an enticing second-round clash with Canada’s Eugenie Bouchard. The former Wimbledon finalist is on the comeback trail after sliding down the rankings and posted a comprehensive 6-2, 6-1 win over China’s Peng Shuai in the opening round. Williams has won her two previous meetings with Bouchard but was wary of the 24-year-old’s fighting qualities. Earlier, Japanese fourth seed Naomi Osaka overcame a nervous start and distraction from flying bugs to ease into the Australian Open second round yesterday. The US Open champion downed Magda Linette of Poland 6-4, 6-2 in just under an hour to set up a meeting with Tamara Zidansek of Slovakia in the next round. “I felt really nervous walking onto the court but then when I started playing I just felt really happy and grateful that I’m able to play in front of such a great crowd,” she said of her experience on Rod Laver Arena. The 21-year-old said she enjoyed the warm Australian conditions but had to call for a ballboy’s help when a bug was fluttering on court as she prepared to serve for the match. “I’m not really that great at catching them, I’d accidentally squish it maybe, so it’s probably not a good idea” she said. Osaka quickly put aside her brush with Australian wildlife and sealed the match with an ace. It was one of six aces she fired down during the match, declaring herself happy with the way she was overcoming jitters about her serve at the season-opening Grand Slam.